ZZZRT ZD-5567 Hair shears are 6 inches long hair cutting scissors which are made of highest quality Japanese stainless steel J2 which is known as very durable and thus long-lasting material. These scissors have razor edge convex hollow ground blades which are not only hard and tough, but also razor-sharp, so they provide precise and smooth hair cut for long time, without loosing their original sharpness. They also have shock absorber between handles, ensuring comfort and smoothness during hair cutting. These ZZZRT shears have one important feature – adjustable tension screw for tightening or slackening whilst hair cutting. They also have finger rest for comfort, but it cannot be removed if it is disturbing. They have soft rubber finger rings in handles which can be inserted or removed for size adjustment and stress reduction during hair cutting. It should be mentioned, that these ZZZRT hair cutting scissors come with storage pouch for comfortable and safe movement. Comparing these shears with other hair cutting scissors, these are quite modern, because they have few design features which give them unique look. For example, jagged blades – in this case jags have no practical function, but only function of design element. Another feature is red diamond screw which is not only design element, but also screw for tension adjustment. Asymmetric handles give stylish look, without loosing their stability and functions. 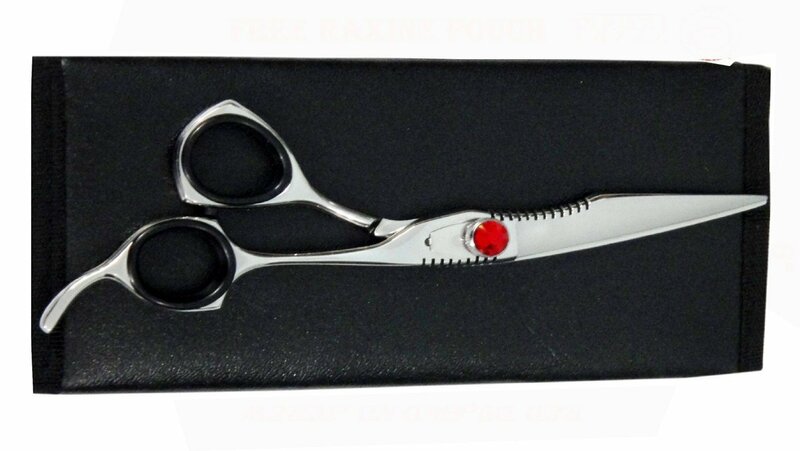 These shears are silver color with slight polish for nice sheen. It should be mentioned, that their blades are not straight as regular blades, but they are convex. These ZZZRT hair shears are meant for hair cutting and they can be used for different hair cutting techniques, for example, slice, chip, point and blunt. Considering their advanced features, design and price, they are more suitable for professional hairdressers. These ZZZRT ZD-5567 Hair Shears are hair cutting scissors which are made of Japanese stainless steel J2. They are 6 inches long and 5.6 ounces light. These barber shears have razor edge convex hollow ground blades, adjustable tension screw, shock absorber, non removable finger rest and removable rubber finger inserts. Talking about their design, they are silver color with slight polish, they have jagged convex blades, red diamond screw and asymmetric handles. These hair cut shears are more suitable for professional usage, using different, simpler and more complex hair cutting techniques. They come with storage pouch for comfortable and safe movement.